"Australia's Leading Business Thinker," tells women if they expect success, they will achieve success. Expect great returns and that's what you'll get. 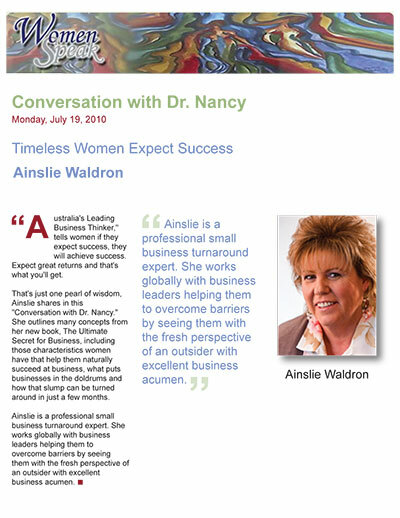 That's just one pearl of wisdom, Ainslie shares in this "Conversation with Dr. Nancy." She outlines many concepts from her new book, The Ultimate Secret for Business, including those characteristics women have that help them naturally succeed at business, what puts businesses in the doldrums and how that slump can be turned around in just a few months. Ainslie is a professional small business turnaround expert. She works globally with business leaders helping them to overcome barriers by seeing them with the fresh perspective of an outsider with excellent business acumen.